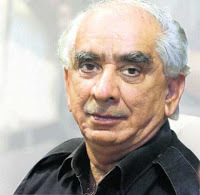 Former Foreign Minister of India Jaswant Singh who written the book "India Partition Independence" has reached Karachi yesterday and tomorrow on 14th April 2010 he will be launching his book. In this book Jaswant Singh has written about the Personality of Quaid Azam Muhammad Ali Jinnah and declared him a Great Man. In the book Jaswant Singh also called Nehru the main person responsible for Partition of India not Quaid Azam. After the Launch of the book Big reaction came from Indian Political parties and Media and Jaswan Singh was expelled from his party BJP. Jaswant Singh has reached the Karachi on 12th April for 6 days and will launch the book on 14th April in Islamabad. He is also giving Interviews to different TV Channels. Jaswant Singh said in an Interview that I stand by what i write about Quaid Azam Muhammad Ali Jinah and i have no shame on it.He said it was my obligation to meet people of Pakistan after writing this book. This is the same Jaswant Singh who was a big enemy some years ago but his thinking changed after his research about Quaid Azam Muhammad Ali Jinah.